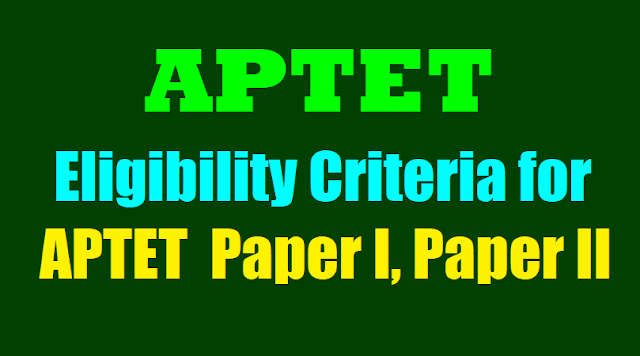 Eligibility Criteria for APTET 2019 - AP TET Paper I, Paper II A, Paper II B Qualifications: Eligibility Criteria for APTET 2019 Notification, Eligibility Criteria for AP TET Paper I, Paper II. Eligibility criteria for AP TET Paper I, Eligibility criteria for AP TET Paper II, Minimum Educational Qualifications with Pass Percentage for APTET 2019. The candidates at the time of applying for APTET, 2019 should be in possession of the minimum qualifications prescribed for a teacher for I to V classes (Paper-I) and VI to VIII classes (Paper-II) as given in Information Bulletin. The candidates who are pursuing final year of any of the Teacher Education Courses recognized by the NCTE or the RCI, as the case may be, during the academic year 2019-2020 can also appear for the APTET , 2019. However, it is clarified that appearance or a pass in APTET by itself will not vest any right on the candidate to be considered for appointment to the post of Teacher in Government / ZillaParishad / Mandal Parishad / Municipal and Private Aided Schools, unless he is in possession of the qualifications prescribed for appointment to such post in the relevant statutory recruitment rules framed by State Government from time to time or by the said management as on the date prescribed there in. Eligibility Criteria: The candidates at the time of applying for APTET, May 2019 should be in possession of the minimum qualifications prescribed for a teacher for I to V classes (Paper-I) and VI to VIII classes (Paper-II (A) & (B)) as given in Information Bulletin. The candidates who are pursuing final year of any of the Teacher Education Courses recognized by the NCTE or the RCI, as the case may be, during the academic year 2018-2019 can also appear for the APTET May, 2019. The candidate at the time of applying for APTET-, 2019 should be having the minimum qualifications prescribed for a teacher for category I to V classes (Paper – I) and VI to VIII classes (paper-II) as given below. 2. Minimum Qualifications for Paper II A and Paper II B (Classes VI-VIII): ELIGIBILITY: The candidate at the time of applying for APTET- May, 2019 should be having the minimum qualifications prescribed for a teacher for category I to V classes (Paper I) and VI to VIII classes ( paper-II (A) & (B) ) as given below. Intermediate / Senior Secondary (or its equivalent) with at least 50% marks. However in case of SC/ ST/ BC/ Differently Abled candidates, the minimum marks shall be 45%. AND pass in 2 - year Diploma in Elementary Education / 4-year Bachelor of Elementary Education (B.El.Ed.) / 2 - year Diploma in Education (Special Education). Intermediate / Senior Secondary (or its equivalent) with at least 45% marks. In respect of SC/ ST/ BC/ Differently Abled candidates, the minimum marks shall be 40%. AND pass in 2 - year Diploma in Elementary Education / 4-year Bachelor of Elementary Education. (B.El.Ed.) / 2 - year Diploma in Education (Special Education) in case of the candidates, who have passed or admitted to D.El.Ed / D.Ed., course prior to issue of these guidelines. (ii) 4- year B.A.Ed / B.Sc.Ed., with at least 50% marks, in case of SC / ST / BC/ Differently Abled candidates, the minimum marks shall be 45%. 4-year B.A.Ed / B.Sc.Ed., with at least 50% marks, in case of SC/ ST/ BC/ Differently Abled candidates, the minimum marks shall be 45%. Education etc., are also eligible to appear for TET exam subject to the condition that the candidates cannot appear for Teacher Recruitment Test (TRT) with this TET certificate, unless the candidates acquire requisite qualification.